The best part of this recipe is it is very fast, very simple and may be cooked with your eyes closed. 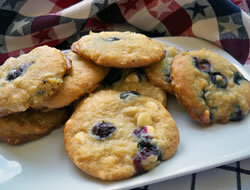 Your kids will love these crispy and chewy cookies. You can also make these cookies with oatmeal and they will be fabulous! Just substitute chocolate chips with oatmeal. Take the butter out of the fridge and let it become soft. Cut the butter in small pieces and mix it with sugar. Add vanilla extract and add in eggs, one after another; mix well. Mix baking soda and hot water in a cup and pour into the egg-sugar-butter mixture; mix very well. Add baking powder and flour; stir well and then add shredded coconut and chocolate chips (or oatmeal). 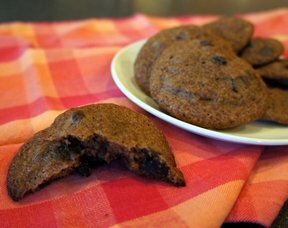 Preheat the stove at 350 degrees F. Form the cookies with a tablespoon and fingers. (Remember that they will grow 2-3 sizes larger, so leave enough space between your cookies). 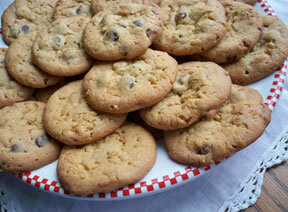 ***Tip*** If you want your cookies to be very-very sweet add the 1 cup of sugar. 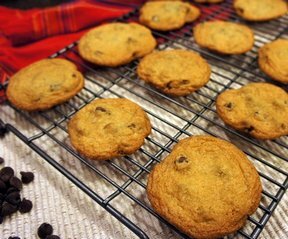 If you want your cookies to be more soft add less flour and bake them for 20 minutes until light golden brown. "These are good chocolate chip cookies. I would use the 3 cups flour next time as they were a little flatter than we like them. And we only baked each batch for 8 minutes so I think the time is a little off. Thanks for the recipe, Helen!"